So here we are closing out the first week of November as of this writing on November 8, 2018. So far the autumn season has been pleasant with a mix of sunshine and periods of wet weather but not much in the way of cold which has made some people very happy and some not so happy. After another hot summer, September came and brought much relief from the hot summer with temperatures ending up cooler than average for the month across all of Lincoln and Sanders Counties. October started off on a cool note but ended up on the warm side of the column. Now we are in November and up to now it has continued to be mild. What will the upcoming winter season bring? I will try to answer that here in this article. There is much discussion going on about the Climate Prediction Center’s (CPC for short) winter outlook which is calling for a weak El Nino to continue to develop across the Pacific and how that may affect the weather across the continent. While El Nino is a significant factor in the weather patterns across North America, it is only one factor of many that can contribute to how our winter will shape up. In any case I keep hearing people say that we are going to have a warm and dry winter because of El Nino or that’s what they heard on TV. Take a look below at these two maps that the CPC has put out for the Winter months of December/January/February 2018-2019. The first one below is a temperature probability map. This map is valid for the months of December, January and February 2018-2019 and was made on October 18, 2018. The way the media and most people are reading this is that the darker orange shading for our region means that we are going to have a warm winter. In reality that is not what this map is saying. What it is saying is that the probability of above average temperatures for the months of December through February is between 50% to 60% or that the odds favoring above average temperatures for the winter months is 50% to 60%. Now take a look at the next map below. This is a precipitation probability map. Again this map was made October 18, 2018 and is valid for the months of December through February 2018-2019. Once again the way the media and most people are reading this map is that the brown shading over our region means we are going to have a dry winter. This too is not what this map is saying. What the map is stating is that the probability of below average precipitation for the months of December through February are between 33% and 40% or that the odds of below average precipitation are 33% to 40%, a long shot difference of stating that we are going to have a dry winter. The explanation here is that in looking at past winter’s with similar conditions we have seen more years with warmer than average temperatures for a stronger correlation and odds favoring warmer than average temperatures but not as clear a signal for precipitation with the overall tending to favor below average precipitation. These maps cover a large area but what about our specific region in far Northwest Montana specifically here in Lincoln and Sanders Counties? I have included temperature and precipitation comparisons for two communities in our region for the months of December through February. For this example I have chosen two years that most closely resemble the pattern we currently have along with the long range forecasts. I have also included the climatic normals for the 3 winter months of December through February. Next I’ll include the data from two years that we have on file for the same two locations for the two years that most closely resemble this one. As you can see from the data provided above the 2 years that most closely resemble where we are right now and closely resemble what is forecasted for the upcoming winter show some variability. The winter of 1958-1959 brought a milder start in December but then turned considerably colder in January and February at both Libby and Thompson Falls. Precipitation was consistently above average throughout the entire winter especially in Libby. For the winter of 2014-2015 we see just the opposite with temperatures running considerably warmer throughout the winter but precipitation running only slightly below average except for February when readings were fairly close to average. Sure there are some other years as well that are similar to what this winter is forecasted to become but these two years most closely resemble where we are now. While El Nino does play a factor in our weather especially during the winter months, it is only one of several factors that can determine our winter weather. One of the main factors that seems to greatly affect our region is the Pacific North America Pattern or PNA for short. Looking back at history for the two winters I have referenced notes that the PNA pattern went from weakly positive in November and December to weakly negative in January and February for 1958-1959 while for the same time period in 2014-2015 the PNA remained in the weakly positive phase but a little bit more so in the positive phase for that winter verses the same period in 58-59. 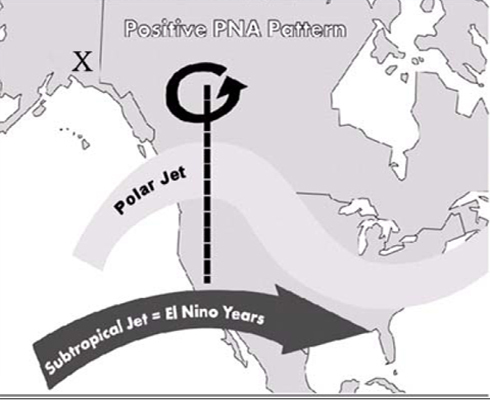 There is a correlation between the positive phase of the PNA pattern and El Nino along with a corresponding negative phase of the PNA pattern and La Nina which is the opposite of El Nino. At this point in time the odds favor a positive phase of the PNA pattern throughout the upcoming 2018-2019 winter which looks much like the chart below. The dotted line represents the upper level ridge axis during the positive phase of the PNA pattern. In addition to El Nino or La Nina and the PNA pattern, one other aspect I like to look at is North American snow cover which so accurately predicted the last 2 winters around here. From the charts I looked at as of November 8, 2018 most of the snow cover across North America, specifically in Canada is located across the eastern part of the region. This in part explains why the pattern across the continent for the end of October into November so far has been cold and stormy in the east and mild and relatively dry in the west, a result of a positive phase of the PNA pattern. Hudson Bay is also beginning to show signs of beginning to freeze over and if it does and the pattern continues to favor continued below average temperatures and snowfall across eastern Canada with upper level ridging across western Canada and the US that may end up locking us into the positive phase of the PNA for the winter with the weak El Nino helping to maintain that pattern. If, on the other hand, the pattern flips, then the opposite is possible. The take away point here is that wherever the snowcover sets up across the continent early i the season often will determine where the so called Hudson Bay low or polar vortex sets up which is what largely governs the patterns across our region. So what does all this mean for our region you may ask and what does it mean for our winter outlook. From the research that I have been able to do the winter outlook for 2018-2019 for Lincoln and Sanders Counties looks something in-between the 1958-1959 winter and the 2014-2015 winter. In other words I believe that we will see a decent start to the winter in late November into December with some snowfall and near average temperatures that will likely persist into the beginning of January. Beyond that, it appears to me that our region may then dry out and ridge up with the jet stream splitting with the southern or subtropical branch shifting more to our south into California and the northern or polar branch shifting well to our north into Northern BC leaving our neck of the woods dry and mild(in the mountains as this type of pattern often results in widespread valley inversions marked by an abundance of low clouds and fog) pattern. So as a whole, I tend to agree with the CPC that odds favor a milder than average winter, although I have to say that I do not necessarily believe it will be a warmer than normal winter except for perhaps in the mountains and also that the odds favor a near normal to slightly drier than normal winter. I do not think that our region will see the amounts of snowfall that have been common around here the past 2 winters but some significant snowfalls are certainly possible. Also I would not be surprised to see some significant cold air outbreaks particularly if a strong positive phase of the PNA develops. Those cold air outbreaks are more likely to occur in December some time and again later into January or February. Towards the end of the winter season in later February or March we may see some wetter weather in our region but that is only a guess at this point. So in summary for Lincoln and Sanders Counties I expect populated areas in the lower elevations to see near to perhaps slightly above average temperatures for the winter and near to slightly below average precipitation for our region. Will I be correct? Time will tell. Please feel free to leave comments and share with others.